If something goes wrong with the roof of your home it can cause a lot of problems. Not only is it likely to be expensive to repair, but can also lead to damage inside the house due to water penetration. The best way to avoid expensive repairs bills is to ensure your roof is looked after all year round. Here are some tips to help you keep your roof and your home in top condition. Clearing the gutter regularly is important. Gutters often become clogged with leaves and dirt. New plants can even grow in neglected gutters. Blocked gutters mean the water won’t drain away property from the roof. Also, check that the gutters themselves are in good condition. Sometimes they can be become detached. This can be caused by poor building work or more commonly by the weight of mud and debris and water that has accumulated in blocked gutters. Many of the problems that lead to roof repairs are caused by damage from trees. Overhanging trees can drop leaves and debris leading to blocked gutters and downpipes. Damage due to branches hitting against the roof is not uncommon, especially during storms. Make sure that large trees which reach the height of the roof are pruned regularly to avoid problems. This can be particularly tricky if the tree in question is overhanging from a neighbour’s garden. Hopefully, you can discuss it diplomatically and reach an agreement. Flat roofs need extra care. Because they have less of a gradient there is a tendency for water to pool instead of draining away. This should not be a problem if the roof is designed properly with the right gradient or “fall”. Unfortunately, in practice, this is not always the case. Also, make sure that downpipes are clear and in good condition. Choose a reputable company to carry out repairs. Roof repairs can be complicated and issues such as access and safety need to be taken into consideration. Find a qualified roofer, ideally one who comes with a recommendation. Check if your roofer has experience of dealing with similar types of jobs and similar types of properties and make sure you are happy with all the details of costs, materials and timescales before you decide. Active Roofing can offer you a full range of professional and fully insured and guaranteed services to keep your roof in top condition. 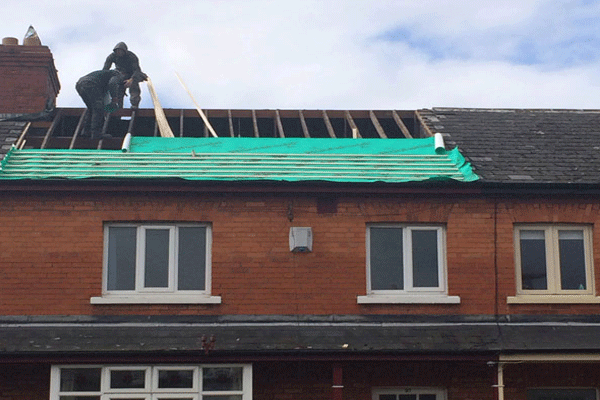 Call Active Roofing for a free quote from the leading roofers Dublin has to offer.